The rugged Maine waterfront is my muse. It is an environment where the power of the ocean sculpts the condition and shape of things. 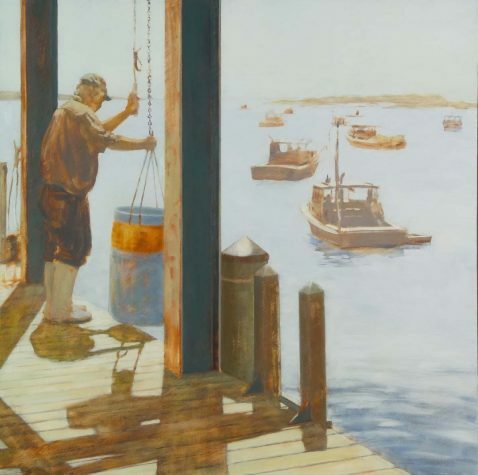 The landscape, the docks and bait shacks, and the people who work at the water’s edge exhibit an honest strength tempered by a forthright resignation to the elements. The cracked and worn surfaces express the salt air. Buildings rest high on the organized chaos of pilings. The earth is ripped away, exposing the angular tangle of rock. The struggle against the ocean is everywhere. It’s a raw and truly beautiful place to paint. Once I have decided on a composition, I seek to create paintings that have a truth of atmosphere and being. Although my subjects are taken from life, I try to create paintings that express something of my memory or sensory experience of a place rather than a methodical visual representation. I’m searching for the smell of the place, the mist in the air, the land dissolving into the solid mass of light, and the music in my head as I stand at the water’s edge looking out. It’s not what I see that I’m trying to paint, it’s how I see. I enjoy the mentally and physically intensive process of carving and shaping my pieces to exude a rhythmic motion, balance, and harmony. My figurative artwork is further inspired by mythology and a vision of ancient peoples. The challenge is to capture the special spirit that each stone possesses. Seeker is an eight-foot-tall, 5,000-pound sculpture created from a block of Jonesboro Red granite from J.C. Stone of Jefferson. It was started last fall at the 10-day Sculpture Symposium at the Viles Arboretum in Augusta. I did not immediately appreciate how hard and massive this stone was, so I was able only to begin the rough shaping process during the symposium. Relocating the piece to my stone studio yard provided a six-month period to both get to know this stone better and to develop my composition. Seeker is an ancient spirit woman seeking divine guidance. 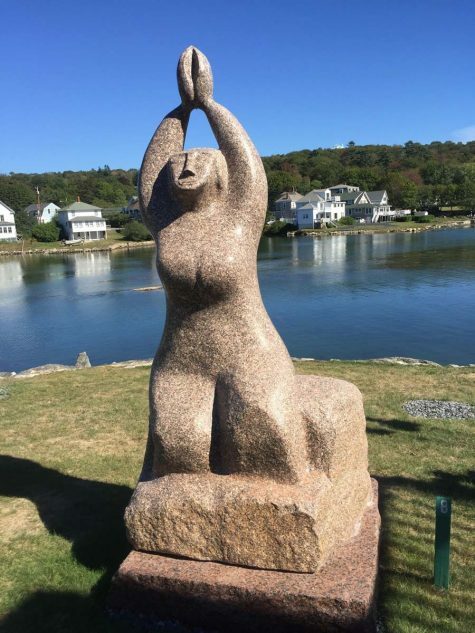 Her body emerges in rough, sharp planes from her stone seat, rising harmoniously and rhythmically through her smooth and highly polished upper body, culminating in her tilted-back head with lidded eyes and arms stretched high toward the heavens. She is centered, focused, and content. 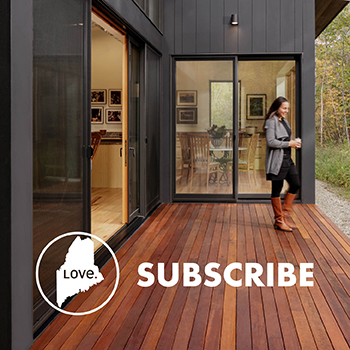 I am fortunate to live in a part of the country that is so picturesque, and I am constantly aware of the natural beauty of Maine when I step out the door every morning. 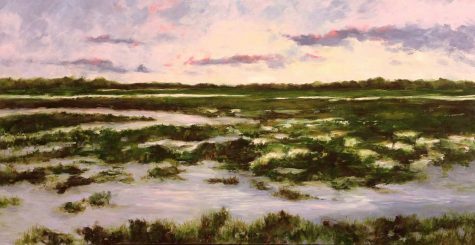 The Maine coast and the tidal marshes are a constant source of inspiration. In my work, I hope to evoke the feeling of being present in the landscape by communicating the quality of light, color, feel of the wind, and vastness of space. A painting can be a record of a certain period that grows out of the process of searching and questioning, obscuring and revealing. An effort is made at finding the truth in experience by developing the places in a painting that are authentic. I most often work from memory, imagination, and intuition to convey atmospheric perspective and timelessness in nature. 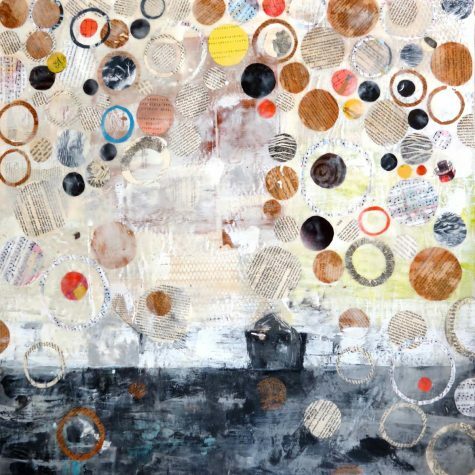 The encaustic paintings from my recent series Layers of Time are composed of circles cut from book pages. The potent, symbolic nature of the circle connects me to the work. In this series, I explore various ideas and themes that the circle shape evokes for me. As the title suggests, my primary theme has been exploring the changing nature of the passage of time. Secondary themes involve the circle of life, the universe, and connectivity. Using a layering process, the book-page circles undergo a transformation. Some settle beneath the surface while others rise to the top; some cluster together while others disperse and float off—a concept similar to the way our memories tend to behave. I have chosen books that have had meaning to me in my life—children’s books my parents read to me and that I then read to my children, and classics I remember reading and then reexperienced as my children read them—and used them in these works as markers of time. By holding these books and repurposing them, by looking at them in a new way, I felt connected to those I love and part of the circle of time. In my most recent body of work, I’ve returned to my roots on the Maine coast. The water has always been a central theme in my life. I never tire of its endless combinations of color and form. I find the water’s meditative effects contrast with its underlying ferocity. 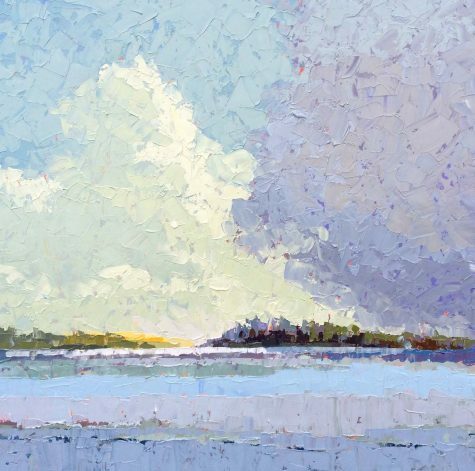 With abstract elements—repetition of horizontal bands and geometric shapes—I create a sense of calm, while the aggressive handling of palette knife and paint mimics the fluidity and raw energy of the subject matter. I’m constantly striving to spend less time with each painting: to represent form with fewer brushstrokes and a simpler palette, and to rely on the mind’s eye to complete the piece, drawing on the viewers’ own impressions, memories, and emotions to ultimately develop a deeper connection to the work.